List #39 of Horror Movies. 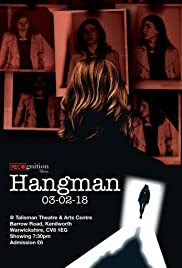 A deranged serial killer, "The Hangman" (Ben Manning: The Snarling) leads Police Detective "Bishop" (Ruth Herd: Hanging In There) on an emotional and disturbing hunt for the truth behind a recent series of murders. Also starring Pablo Raybould (Me Before You, The Snarling), the Hangman's unhealthy obsession and warped sense of vindication becomes personal as Bishop must take any means necessary to bring him to justice in time.